One of the things I have enjoyed most since starting my own marketing agency is the opportunity to get involved with and contribute to the local community. In this context, I joined the organising committee of Open Doors Thame and participated in the first event in 2015. This event provides local businesses – industrial, manufacturing, technology, warehousing, distribution, marketing, B2B service providers, and others – with a fantastic opportunity to showcase their businesses to the people of Thame and its surroundings. The second Open Doors Thame took place on Saturday 7 July. More than 20 local businesses – large and small – had exhibits on the car park outside Thame Town Hall. What’s the objective of Open Doors Thame? Learn more about what local businesses make and do. See, touch, and even climb on locally-made products. Discuss employment, work experience and apprenticeship opportunities. Have a fun day out. This year’s event was a great success. The exhibiting companies had many discussions with interested local residents. Feedback from the visitors was very positive. Most were not aware of the breadth and depth of industry in their town. We are already making plans for next year’s Open Doors event! 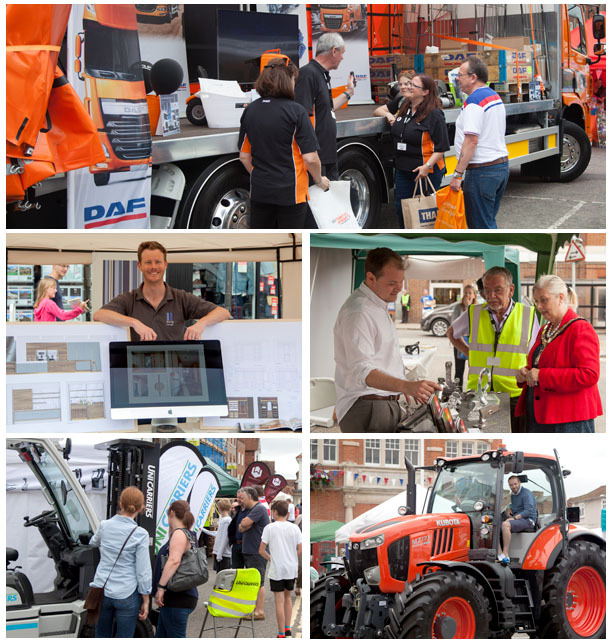 An overview of some of the action at Open Doors Thame 2016. ← Are you eligible for Growth Vouchers to help pay for marketing support?